The garden at the temple Tofuku-Ji (Toofukuji 東福寺) was created by the famous master gardener Shigemori Mirei. The stones are layed out to expresses a dragon, curled in a spiral, with his horns and a few parts of its back visible in the sand. The dragon is invisible in the clouds, but as you walk along, you can almost see it moving in the stormy sky. Click on the THUMBNAIL to see more ! located in the south eastern region of Kyoto City, is one of the most famous places in all of Japan for autumn maple leaf viewing (momijigari 紅葉狩り). The Tofukuji Temple grounds, which include many inspiring Japanese gardens as well as the renowned Seven Temples of the Tofukuji School of Zen Buddhism (1273) among other temples, offer the visitor a visual spectacle beyond the typical momijigari experience. In the height of the maple leaf viewing season (mid-late November), Tofukuji station and the main road leading to Tofukuji Temple is overflowing with people eager to observe the picturesque display of autumn color. Five minutes walk east of Tobakaido station takes you to Komyoin Temple (光明院), a small sub-temple bordering the Tofukuji Temple grounds. Here you will come across what is without doubt my favorite Japanese garden in the entire Tokfukuji Temple grounds. Sandy beaches have been incorporated into the traditional dry wave rock garden design that dates back to the Heian period (794-1185) known as Hashin-tei (波心庭). Thin tranquil waves of stone spread out covering the entire garden body like diffuse streams of light. A tall maple tree stands nearby at ease, providing a calming magnanimous atmosphere. The garden was completed during the Showa Period (1926-1989), before the beginning of the Second World War by SHIGEMORI Mirei. SHIGEMORI was a well known traditional and modern garden designer, and he named this particular garden after the great artist Francois Millet. The temple is dedicated to Fudo Myo-O, one of the Five Great Wisdom Kings. 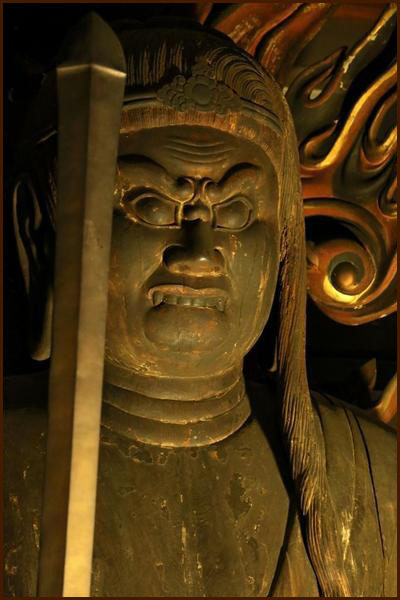 and designated as the Important Cultural Asset.
. Fudō Myō-ō 不動明王 Fudo Myo-O . 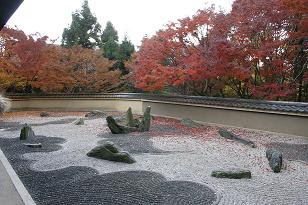 The association of a traditional, disciplined minimalism with Japanese rock gardens, such as that of Kyoto's Ryoanji temple, has become so familiar worldwide, it is virtually a cliche. But there are also great examples of Japanese gardens that go beyond traditionalism to provide tranquility and space for contemplation. Mirei Shigemori (1896-1975), a self-taught garden designer and historian of Japanese gardens, challenged the conventional design of Japanese gardens. He refused to imitate the style of a specific master or school of landscape gardening — a way of teaching that in Japan was common to traditional art and craft forms such as painting, ikebana or pottery. Born in the Kayo, Jobo District, Okayama Prefecture — where he grew up surrounded by the grand landscapes of Goukei ravine, which remained an inspiration throughout his life — Shigemori moved to Tokyo in 1917 to study nihonga (traditional Japanese-style painting) at the Tokyo School of Fine Arts. To deepen his understanding of Japanese aesthetics, his studies led him to explore a broader spectrum of Japanese culture, including art history, philosophy, calligraphy, the tea ceremony and ikebana. Instead of pursuing nihonga, however, Shigemori joined the avant-garde debate on ikebana, criticizing the art form and attempting to create a new style of flower arranging. It was around this time that he also became interested in traditional Japanese gardens. Though he had actually completed a garden and tea room on his family's property in 1924 — working on them with his father — it took another 10 years before Shigemori chose to settle on designing gardens as his profession. After the 1934 Muroto typhoon left a path of destruction across western Japan, Shigemori, worried that more gardens could be lost without a trace in the future, began to survey and document the country's most important ones. Within three years, he researched, measured, photographed and sketched more than 400 gardens, and in 1938 he published the 26-volume "Illustrated Book on the History of the Japanese Garden." It was an unprecedented documentation of Japan's major gardens, which also provided Shigemori with the comprehensive and profound knowledge of landscape gardening that helped his career take off. Chisao, Mirei Shigemori's grandson, also a garden designer, said in a recent interview that through the extensive research, his father learned that "each significant garden was created with the cutting-edge spirit of the time." Shigemori's first major work was for Kyoto's Tofuku-ji Temple in 1939. He used geometric shapes and forms in designs for four gardens that are now considered some of the earliest examples of the modern Japanese garden. "My goal is to create a modern garden, not by replicating traditional gardens of old times," he once said. "But by studying carefully and learning from them." It was a unique approach from someone who lived in an era when artists in Japan were confronted with the tension between the post Meiji Restoration (1868) modernizing influence of the West and the promotion of Japanese tradition by a growing resistance to such cultural change. Mirei chose to follow neither Western style nor stick to conventional tradition. Instead, his gardens retained the quintessential element of a Japanese garden — the primordial power that the Shinto tradition attributed to nature — while advocating the modernist spirit. He designed more than 200 gardens throughout his life, most of which were karesansui (dry landscape or rock gardens). Nothing can match visiting a Shigemori garden, but Tokyo's Watari Museum of Contemporary Art (Watarium) has found a way to bring Shigemori's garden to the viewer. As well as a comprehensive visual history of Shigemori's work, including photographs, projections and drawings, three replica sections of the Hassou Gardens of Tofuku-ji have been reproduced as large-scale installations: Hokuto Sichisei (Big Dipper) of the eastern garden, the Eiju and Horai stones of the southern garden and part of the checkered northern garden. For authenticity, each installation has been made to scale — the abstract composition of "Checkered Garden" is even recreated with real moss. The exhibition also presents some of Shigemori's paintings, calligraphy and interior design work, reminding us that he was a multidisciplinary artist who brought ideas and skills from different disciplines to garden design — something that helped assert gardens as an integral part of the modern art form. The large film projection of the top floor of the museum, shows viewers other representative works, such as the avant-garde geometric gardens of Kishiwada Castle in Osaka and his prehistoric-inspired garden of Matsunoo-Taisha temple. Chisao said his grandfather, "focused on the avant-garde garden and devoted himself to the renewal of the garden as art, keeping roots in tradition but relevant to modern life." The Watarium takes that even further by turning Shigemori's gardens into exhibits outside of their actual location, and giving them the artistic respect that they deserve.
. Matsunoo Taisha 松尾大社 Matsunoo Grand Shrine . Three gardens designed by Mirei Shigemori during the Showa era. 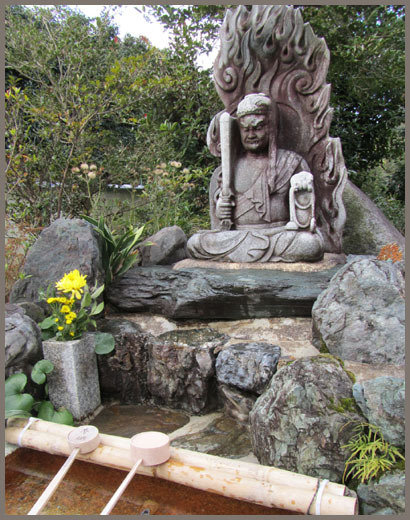 Karesansui 枯山水 (dry landscape gardens, also known as rock gardens and waterless stream gardens) are typically associated with Zen Buddhism, and often found in the front or rear gardens at the residences (houjou 方丈) of Zen abbots. The main elements of karesansui are rocks and sand, with the sea symbolized not by water but by sand raked in patterns that suggest rippling water. Representative examples are the gardens of Ryoanji Temple and Daitokuji Temple, both in Kyoto. Plants are much less important (and sometimes nonexistent) in many karesansui gardens. Karesansui gardens are often, but not always, meant to be viewed from a single, seated perspective, and the rocks are often associated with and named after various Chinese mountains. The first-ever Zen landscape garden in Japan is credited to Kenchoji Temple in Kamakura. Founded in 1251, this temple was the chief monastery for the five great Zen monasteries that thrived during the Kamakura era (1185-1333). It became the center of Zen Buddhism thanks to strong state patronage. Mirei Shigemori (1896–1975), a landscape architect and scholar trained in painting, flower arranging, and tea ceremony, is increasingly admired for his contemporary Japanese garden designs. Believing that the Japanese dry landscape garden (or Zen garden) had fallen into cliché, Shigemori applied modernist shapes, colors, and materials to create stunning avant-garde works that also celebrated the ancient gods and beliefs at the heart of Japanese culture. "Shigemori Mirei: Hokutoshichisei no Niwa Ten"
From Dec. 4, the Watari Museum of Contemporary Art explores the essence of Japanese aesthetics through a retrospective exhibition of Mirei Shigemori (1896-1975), a Japanese garden designer and historian. Shigemori designed more than 200 gardens, basing his work on extensive research. He is well known for his karesansui (traditional rock-garden) creations that are serene yet contrasting scenes of white stone and vibrant greenery. from Dec. 4, till March 25, 2012. When a new treasure house and building for ceremonies was constructed in 1971 at Matsuo-taisha in Kyoto, which dates back to 701 and is among Japan’s oldest shrines, one of the most influential landscape designers of his day, the largely self-taught master Mirei Shigemori, was commissioned to create a series of gardens on the site. Shigemori (1896-1975) frequently used the term “eternal modern” to represent his ideas and to define the aesthetic sense that qualifies much of his work. The expression, he explained, referred to his concept of the balancing of beauty; a parity between the classical and contemporary. Nowhere is the application of this term more evident than at Matsuo-taisha, where Shigemori was able to synergize tradition and modernity. Growing up in a hamlet in a rural area of Okayama Prefecture in western Honshu, Mirei spent much time in the nearby town of Kibichuo, especially in the grounds of Yoshikawa Hachimangu Shrine, a rustic building founded in 1096 that emanates a markedly refined sense of beauty and proportion — a structure, in fact, that is replete with the temporal-spatial details that would influence his own aesthetic sense. As a young man, Shigemori, who was an inveterately curious researcher, traveled all over Japan to undertake a comprehensive survey of more than 300 man-made landscapes. The first volume of this work, published in 1936 as “The Illustrated History of Japanese Gardens,” makes us aware of the versatility of these gardens’ creators and their knowledge of Japanese design and art.